A canopy, preserved in the Erfurt Cathedral, with coat of arms and the date 1688 has been restored recently. C.M. 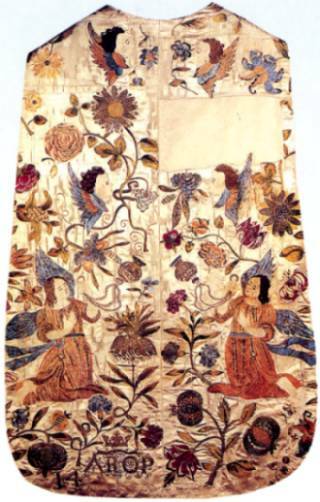 Jeitner groups around this piece other embroideries, and with her study she proves that this group was made in a workshop of the "Neuwerk" convent. In the cathedral's inventory she discovered a chasuble which is stilistically very similar to the above mentioned baldachin of 1688. Obviousely this chasuble was made from an embroidered wall hanging. Here the initials A.R.O.P can be found and these same letters occur on other vestments. Moreso some other initials M.F.D.P and the date 1745 is embroidered on two dalmatics of the same inventory. Fortunately in the archives of the cathedral appeared a document which helped to solve the initials. 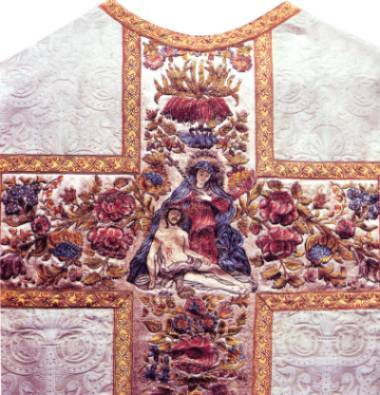 The chasuble was commissioned by Mater Priorissa Anna Rosalia Osburgin, and the embroideresses were: sister Theodora Thomanin, sister Joanna Dorothea Rauchlin and sister Maria Foelicitas Draegerin. All three of them were nuns in the convent "zum heiligen Kreuz". The document also says that master Nicolaus Baeumler made the chasuble on 3rd of september 1729. Other embroideries with dates and similar stilistic pecularities point to a tradition of the workshop during almost 70 years. The dalmatic with the date of 1745 was commissioned by Marie Felicitas Draeger. In the above mentioned document she appeard as one of the embroideresses and now she had become prioress of the convent. It is known that she was born in 1687 and entered the convent as a child of 13 years of age. At the age of 21 she gave profess, and in 1730 she became prioress. She built the new Crucis church from 1731-35. When this church was restored from 1978-86 her initials MFDP were found in many places and in a playful manieristic style. She died in 1747. C.M. Jeitner believes that Maria Felicitas Draeger also designed her embroideries. Probably she was no longer active in textile works after 1740. She must have been the last nun to practice gold embroidery, a technique that cannot be found any more in later works.